Background: Don Pepin blends often find their way into our hands and let me tell you – we are thankful that they do. This offering from Pepin is a small batch release that is specific to the Casa de Montecristo. It comes in four vitolas – a rubusto, perfecto, toro, and torpedo. The meaning of the cigar’s name, Oro de Nicaragua, is “Nicaraguan Gold”. And if it’s anything like the other My Father smokes, it’s bound to be a good one. 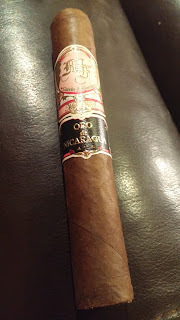 But let’s see if it does indeed hold up to the gold standard with this Nicaraguan puro. Appearance (0-20): The Oro de Nicaragua has a darker wrapper than many of the My Father lines, giving off a nice rich milk chocolate color. It has the standard My Father band with the gold MF logo and “My Father” script, the light peach backdrop, and some hints of green on the main label. 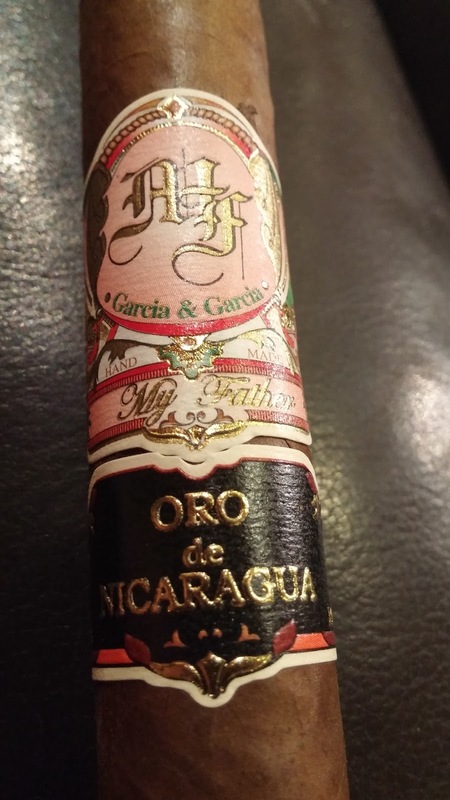 This is flanked below with the particulars of the smoke – a black label with gold embossed lettering “ORO de NICARAGUA” and some matching colors below it to tie it in with the main band. Along the stick there are no real veins of note, or blemishes, but there is a small crack on one side. I’m considering this a slight appearance issue since it looks like just a thin part of the wrapper is cracked slightly. Construction (0-20): From the initial feel the stick is a solid one with no issues. It is packed well and is tightly wrapped. The initial cut had no debris, and the draw was right on the money. Lighting up was quick and easy and the burn line stuck sharply throughout. Ash held for multiple inches at a time. And I’m happy to say the draw stayed nearly perfect throughout. Like most Pepin blends – this one is well constructed. 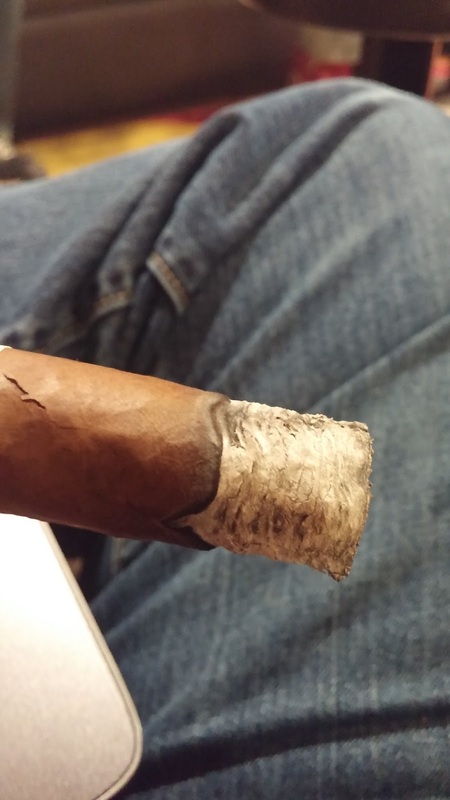 Strength (0-20): Medium with a slight tip toward the full spectrum is what the cigar is marketed as, and it certainly ends up falling just right there. There are slight deviations from the central strength, but overall it’s close. Flavor (0-20): I have made a lot of comments about this being a Pepin blend and it’s the most evident when lighting up. If you know anything about his way of operating, you’ll know it begins with a strong pepper blast. I’m talking the sort that stings the mouth and nostrils pretty hard. But the initial blast of pepper is fleeting and quickly drops to just a supplementary flavor that’s most seen in the retrohale. The main body is more based around a rich earthy taste. There’s a slightly bitter coffee flavor that you can pick up on and something that can best be described as the taste of fresh leather. Around the first third there is a bit of creaminess that sneaks in and tones down the pepper even further. It’s still there, mind you, but really well balanced. Beyond the midway point I was picking up some nutty flavors that were, that’s right, peppered. There’s a bit of woodsy taste that pops up too, and some wood. Occasionally I was able to pull out some kind of really sweet notes that I can’t describe adequately. I want to say it reminds me of the sweetness you can pull from some fruits, but again, I can’t quite put my finger on which. Value (0-20): $10.00 puts this in with a number of the heavyweight cigars out there. I personally think it’s worth the money, especially given it’s a small batch smoke. Not a bargain, but a solid price. Additional Notes: Paired with water. Provided by Casa de Montecristo - Chicago. Overall (0-100): Pepin delivers again with this offering with a stick that quite honestly – is outstanding across the board. It’s rich and complex while being well balanced, and doesn’t teeter off the rails where other cigars may. The flavors play really well together, mixing a lot of those opposing flavors – bitter but sweet, peppery but smooth, woodsy and earthy. It all just works. In fact, everything about it – the construction, appearance, the strength, and even the price – are completely on point for what this is. Swing over to Casa de Montecristo - Chicago and give one of these a try. It’s worth it.